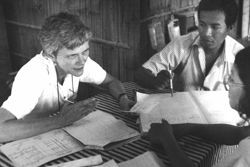 Jean Jachman R.N., long time supporter of CHC at the Site 2 South Hospital, Site 2 Refugee Camp, Thai-Cambodian border, 1987. We recently learned that Jean Jachman, long-time friend of the CHC, passed away on December 9, 2012 in Minneapolis, Minnesota. Jean spent much of her time in the 1980s working in the Thai-Cambodian refugee camps serviced by the American Refugee Committee, where I first met her. A gifted nurse, she provided care to desperately sick patients and risked her life daily for the sake of the refugees. We will never forget her. When refugees repatriated back to Cambodia, Jean found time to visit her friends, coming to Svay Rieng province to the CHC when it was founded in 1995. She encouraged us to continue to move forward to bring changes to the health care sector to improve the quality of life for as many of our countrymen as possible. She graciously hosted me whenever I visited the USA, always providing a warm welcome. A lovely and joyful person, CHC will remember her always.